WATCH: Wrap of Billionaire Donald Trump's victory in US presidential election by White House correspondent Mary Alice Salinas. The billionaire businessman, who was widely underestimated and even mocked by the political and media class throughout his campaign, pulled off a stunning and decisive win Tuesday over his rival, ex-Secretary of State Hillary Clinton. “I pledge to every citizen of our land to be a president for all Americans,” said an exuberant Trump, surrounded by his family and top aides at a victory party in New York City early Wednesday. President Barack Obama congratulated Trump over the phone and invited the president-elect to meet with him at the White House on Thursday. "Ensuring a smooth transition of power is one of the top priorities the President identified at the beginning of the year and a meeting with the President-elect is the next step," Press Secretary Josh Earnest said. It is an improbable victory for a candidate who has never held elected office and who ran one of the most unorthodox campaigns in U.S. history. It also brings to an end one of the most contentious and divisive presidential campaigns in recent memory. Trump, a Republican, captured at least 288 electoral votes compared with 215 for the Democrat Clinton, according to figures early Wednesday. Despite his strong electoral vote tally, Trump appeared to be headed for a narrow loss in the popular vote. It would be just the fourth time in U.S. history that the presidential winner has lost the popular vote. At Trump headquarters, the scene was jubilant, though remnants of a divisive campaign were still evident. Even as it became clear that Trump would win, his supporters repeatedly broke out in chants of “lock her up,” referring to the Democratic nominee. Investors reacted less positively, with global markets and U.S. stock futures sent into turmoil as it became clear Trump would win. 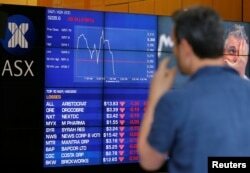 A man reacts in front of a board displaying stock prices at the Australian Securities Exchange (ASX) in Sydney, Australia, Nov. 9, 2016. Trump’s victory amounts to a massive failure for opinion polls, which showed Clinton with a seemingly safe 3-4 point lead in the final days of the campaign. Many respected pollsters had put her odds of winning at more than 90 percent. Trump had for weeks shrugged off the significance of opinion polls, saying they were products of a system that was rigged against him and insisting that the size and passion of his rallies were a better indicator of public sentiment. According to exit polls, Trump benefited from a larger than expected turnout among his base of white rural voters, many of whom feel left behind in a changing economy and were attracted to Trump’s anti-trade, anti-immigration stands. In the end, that was enough to offset Trump’s lack of support among minorities. Exit polls show that nearly 9 in 10 African Americans and two-thirds of Hispanics voted for Clinton. 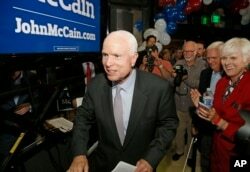 Sen. John McCain, R-Ariz., is pictured after winning the Arizona Republican primary in Phoenix. On Tuesday, McCain won his sixth term at age 80, in what possibly was his final campaign. McCain is one of the Republicans who Donald Trump has clashed with. Trump will take office with a Congress fully under Republican control, after the party Tuesday not only protected its majority in the Senate, but solidified its control of the House. That means Republicans will be able to fill vacancies on the Supreme Court, likely resulting in a shift to the right that could last a generation. But still, the Republican Party faces massive challenges, having been largely divided over Trump’s candidacy. Over the course of his campaign, Trump has lashed out at mainstream Republicans and has rejected many aspects of traditional conservatism.